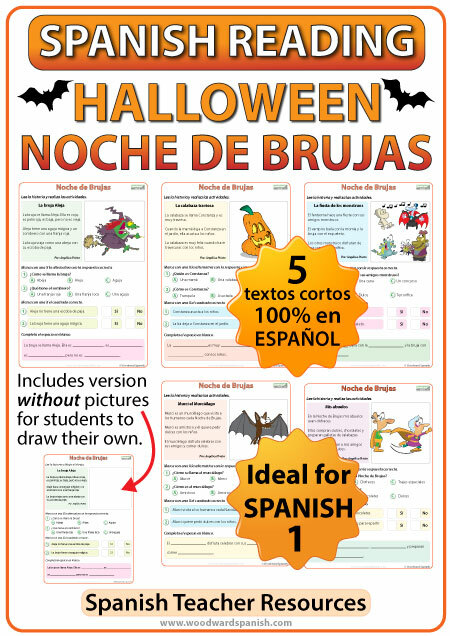 Simple Reading Activities in Spanish about Halloween (Noche de Brujas) for lower level Spanish students (Spanish 1). There is a story about a witch called Aleja, another about a naughty pumpkin and another about the monsters’ party. You will also find a story about a Bat called Murci and finally another story about Grandparents celebrating Halloween. We have two versions of each worksheet. One version with a picture about the reading passage, the other is the same text and activities but without the picture. Ideally this second version would be for younger students since each one has a space where they need to draw (and correctly color) something that is mentioned in the text. We have now included a sheet with the 5 stories on one page (without exercises). This is can be used where the teacher gives the comprehension questions orally, or can be used in conjunction with the audio on our YouTube channel so they can read as they listen (without the distraction of other activities on the page). There is another sheet with the 5 stories on one page, but this time with certain words missing and replaced by a blank line where students can fill with the word they hear on the listening. Here is the audio that accompanies the short stories. It will also give you an idea of the content and level of these short reading passages. 5 textos cortos acerca de la Noche de Brujas con preguntas de comprensión. 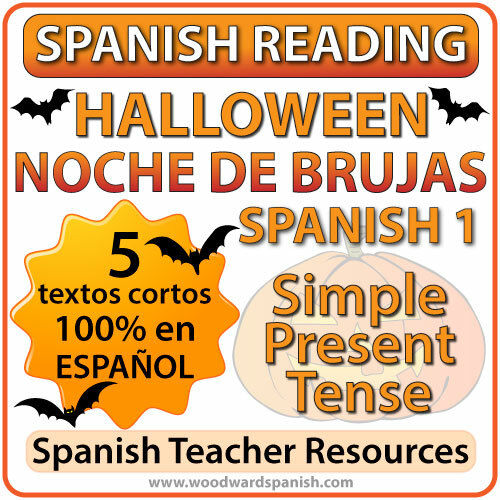 Be the first to review “Spanish 1 Reading – Halloween – Noche de Brujas” Click here to cancel reply.